When it comes to offering big thrills and extreme fun, Jay Peak knows a thing or two about what makes folks happy – afterall, Jay Peak has been one of Vermont’s most popular ski resorts for decades. In recent years, they’ve taken this ‘gusto’ for adventure and planned an expansion which caters to their clientele’s penchant for fun. The result? The Pump House Indoor Waterpark and plenty of other year-round attractions that make the Jay / Montgomery area THE place to vacation in New England. Jay Peak’s new 50,000-square-foot indoor water park is known as The Pump House. 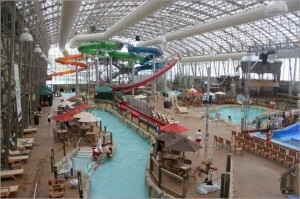 As an indoor facility, the waterpark is weatherproof – no worries about rain, high winds, ice, or extreme cold – and it offers the usual collection of slides and attractions as well as a few unique features. The most striking ride is La Chute, the first AquaLoop to debut in an indoor water park. La Chute riders climb a 71-foot tower, enter a launch capsule, countdown as the capsule’s floor opens, freefall almost straight down in an enclosed tube, and propel up into a near-vertical loop. Those brave enough to tackle the black diamond water ride will reach speed up to 40 mph and experience a force of 2.5 Gs. A long lazy river, complete with some areas of rapids, snakes around the perimeter of the Pump House water park. The Double Barrel, a dual FlowRider surfing attraction, gives two guests at a time the chance to tackle waves on boogie boards.